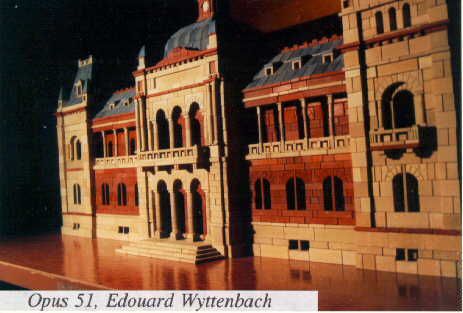 For some reason, I seem to have overlooked Edouard Wyttenbach, one of the most important of the many Swiss builders. He carefully recorded 67 designs. This month the builder's page features two of his earlier designs -- #s 4 and 6. On my own page is a model designed by the Richter Company -- for set # 414. It is a fortified church, quite impressive in that it is really intended for defence, unlike many of the Richter castles. For the month of March, 2000. If there is interest, I will add a full page with more information. It is interesting. For example: Altavista continues to be the most important referring web site, except for eBay while I was selling some (new) sets. Yahoo is second. But recently google.com has become a very important search engine referring site. If you have not tried google.com, I suggest that you give it a try. You will like it. Another very important referring site is johnrausch.com, the puzzle web site. MS Internet explorer passed Netscape in popularity -- MSIE 36%, Netscape 29%, AOL 19%. Operating systems: Win98 36%, Win 95 27%, NT 10%, Mac 8%. I am really out of step with Win 3.1 -- only three, of which I am one (I check the page as soon as I get home from delivering the floppy disk. ).